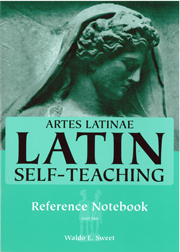 Reference Notebook Level Two is part of the Artes Latinae series, which is a programmed, self-teaching Latin course structured to accommodate multiple levels of students, each learning at his or her own pace. Developed by Dr. Waldo E. Sweet of the University of Michigan for Encyclopaedia Britannica, Artes Latinae is an easy-to-follow, two-level course that includes all the tools a student needs to achieve a firm command of Latin. The course was carefully crafted and refined to suit the needs and abilities of a broad spectrum of students. Students. Artes Latinae meets existing foreign language requirements for high school graduation. This study aids allow students to record and summarize the material they cover while providing a concise review of important grammatical rules and practices—a must for each student.